All of our toy and cash collection efforts in the community are comleted for the year. But you can still donate online! Just Click the Big Red Button at the Top of this page! We donate toys and cash to the following charities: UPMC Children’s Hospital of Pittsburgh, Big Brothers Big Sisters, Beverly’s Birthdays, Pittsburgh Police and other local departments. 2018 was our best year ever, far surpassing our expectations. Over $50,000 was donated to Toys for Pittsburgh Tikes, giving us the ability to provide over 15,000 toys and needed cash donations to over 14 charities that work with us each year. We look forward to even greater campaign in 2019! Saturday, December 8th was a big day for Toys for Pittsburgh Tikes! 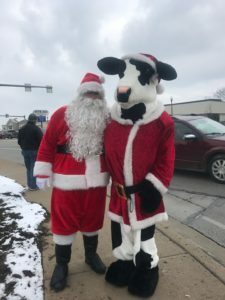 Chick-fil-A Miracle Mile located in Monroeville provided a FREE Chick-fil-A Sandwich coupon to anyone who came in and donated a new, unwrapped toy! Then Santa visited the International Wrestling Cartel’s first-annual Pittsburgh Pro Wrestling Classic, where even more toys were donated. From all our volunteers at Toys for Pittsburgh Tikes, a heartfelt THANK YOU to Chick-fil-A at Miracle Mile and to the International Wrestling Cartel! These events benefited Toys for Pittsburgh Tikes. Visit our 2018 Photo Gallery. Toy and cash donations have finished up for the year, and it was our Best Year Ever, with preliminary estimates of up to 15,000 toys distributed! If you have the opportunity, visit one of these fine participating businesses and say “Thank You” for helping make 2018’s Toy drive an outstanding success. American Legion Post 980, Plum Boro | 2+ Toy Collection Boxes, a Cash Donation Box, and a generous donation from the Auxiliary! Using the red Donate Now! button on the page, you can donate directly to us, all year round! Why Should You Donate to Pittsburgh Toys for Tikes? Toys for Tikes is an ALL VOLUNTEER ORGANIZATION. Only the kids benefit from your generosity! We work with Children’s Hospital, Beverly’s Birthdays, Pittsburgh Police, and more to distribute toys. It’s that simple! Your donations help us buy toys. The toys go to needy Pittsburgh area children, especially at Christmas!